DUMBARTON were unlucky not to gain a point against high-flying Dunfermline Athletic in their first home game of 2018. DUMBARTON were unlucky not to gain a point against high-flying Dunfermline Athletic in their first home game of 2018, losing 1-0 in front of a 1,086 crowd at the YOUR Radio FM 103 Stadium. A goal from winger Joe Cardle on 24 minutes was enough to give the visitors all three points in a competitive game. It was even affair for the first 20 minutes of the opening period until a long switch brought Cardle into play and he took a smart touch before curling looping shot over keeper Scott Gallacher into the far corner of the net from 22 yards. The opener had come just after a period of pressure from Sons. But it was the Pars who took confidence from the goal and who could have added more before the break. Dumbarton pressed back hard in the second half. Towards the end of the game they piled o the pressure but could not find the quality ball or break in the final third that they needed. On 85 minutes substitute Christian Nade came close, but was just squeezed out. Then right at the end of the 90 minutes David Smith came agonisingly close to an equaliser for Sons, but ended up firing two shots just over. The Sonstrust man of the match was Stuart Cardwell, rewarded for another solid performance. 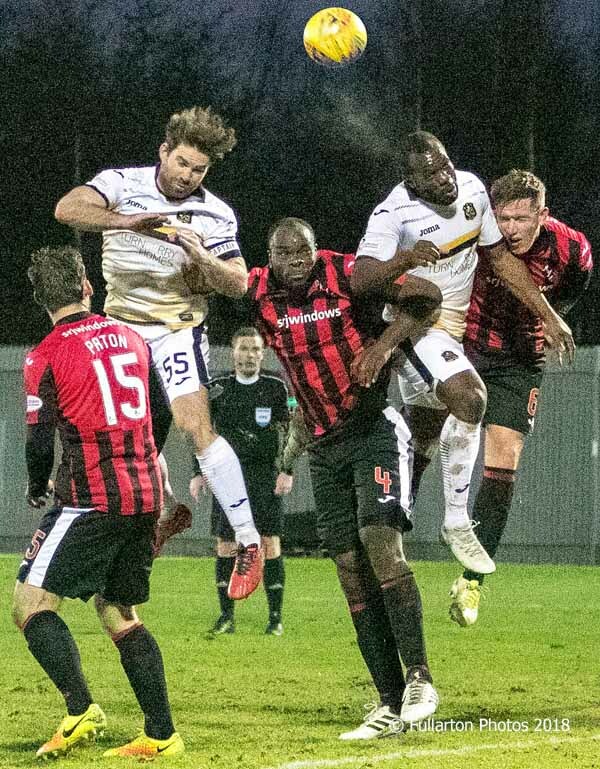 The picture shows Craig Barr and Christian Nade attacking a corner.